A reporter from Al Jazeera TV (a Syrian Medical Doctor) visited the Center for Environment, Health, and Field Sciences, Chiba University, to interview me. On November 17, 2010, the interview was aired several times as a feature of "News Harvest" and other popular programs. 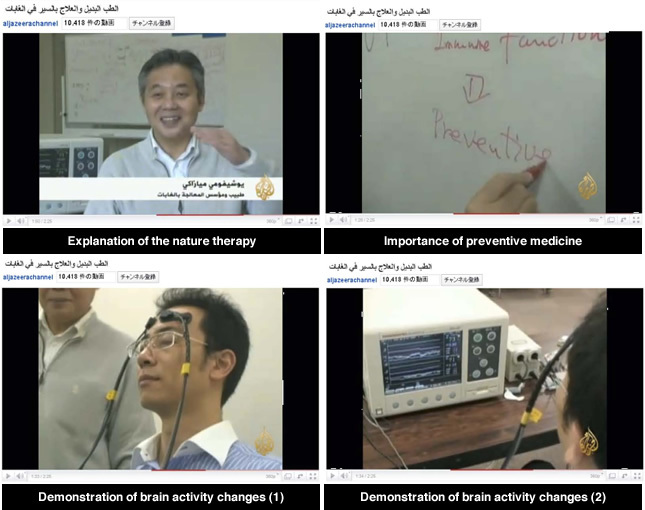 The news topic was titled "Forest bathing and alternative medicine", and broadcast for two and a half minutes in Arabic. It was also submitted to "You Tube (http://www.youtube.com/watch?v=3yVxIYv4bmY)" and is now available for you to play. Living in these modern times, in what sort of state are our bodies? Five million years have passed since humans became humans. Because we have already spent more than 99.99% of our evolutionary history in natural environments, it is believed that we are essentially adaptive to nature. However, we are living in a society characterized by urbanization and artificiality, whereas our physiological functions are still adapted to nature. Because of this, stress levels are always too high and our sympathetic nervous system is also in an overly stimulated state. Therefore, there is an urgent need to reduce such elevated stress levels to the approximate level that our bodies can cope with. This is exactly where nature therapy fits in. As our bodies get closer to the expected state of our natural well-being, our immune functions become enhanced and our bodies become more disease resistant. For example, although we treat ourselves with antibiotics when we contract pneumonia, we are not expecting nature therapy to produce such a specific effect. Instead, we expect preventive medical effects whereby our bodies will become resistant to pneumonia as a result of increased immune function induced by the relaxation of bodily stress. In a collaborative study with the Nippon Medical School, involving Li as principal investigator, it was demonstrated that immune functions are enhanced by nature therapy in forests. Middle-aged employees working for major corporations in Tokyo volunteered to participate in our study. First, we examined the natural killer cell activity (NK activity) as an indicator of immune function (particularly as an indicator of anti-cancer activity) in 30 volunteers. Furthermore, our study of nature therapy was initiated with a study of 12 “hard workers” who had no subjective symptoms but complained of having little energy with decreased immune function. On Friday morning, they took the Shinkansen (bullet train) to the nature therapy station located in Iiyama City, Nagano Prefecture, and walked in the forest for 2 hours on the first day, and 4 hours on the second day, for a total of 6 hours. To our surprise, NK activity was enhanced by 56% on the second day, returning to normal levels. A statistically significant increase of 23% was maintained for 1 month even after these volunteers had returned to urban life, clearly illustrating the preventive medical effects of nature therapy. We expect nature therapy to play an increasingly important role in preventive medicine in the future. To provide assessment endpoints, we simultaneously measure stress hormone (cortisol) levels in saliva, amylase activity in saliva and autonomic nerve activities (sympathetic and parasympathetic) as monitored by heart rate fluctuation, heart rate and blood pressure. In addition, they have pioneered the technology needed to monitor the prefrontal cortex activity of the brain using near-infrared spectroscopy. With Li as the principal investigator, we are conducting a study on natural killer (NK) activity as a marker of immune functions and studying anti-cancer proteins. As a result, they have attempted to confirm the physiological effects of relaxation on 504 volunteers undergoing various kinds of nature therapy at 42 different forests throughout Japan. From 2005 to 2009, we conducted studies, each lasting about a week, in forests at 42 different sites throughout Japan, ranging from the Yanbaru Kuina forest in Okinawa to the Kushiro Swamp in the large northern island of Hokkaido. As a result of studies involving 420 volunteers at 35 different sites, the group of volunteers looking at natural surroundings while sitting down showed the following endpoint decreases compared with the urban control group: a 12.4 per cent decrease in cortisol level, a 7.0 per cent decrease in sympathetic nerve activity, a 1.4 per cent decrease in systolic blood pressure and a 5.8 per cent decrease in heart rate. This proves that stressful states can be relieved by nature therapy. It should also be pointed out that parasympathetic nerve activity was enhanced by 55.0 per cent, indicating a relaxed biological system. The blueprint for shinrin therapy stations is based on an approval system. Prefectures, cities, towns, villages and corporations can submit approval requests for candidate forests. The final approval is made after reviewing (1) the actual validation study carried out on the physiological effects of relaxation, (2) intangibles such as accommodation plans and (3) tangibles such as the forest's environment and facilities. This blueprint is being promoted by Japan's Forestry Agency and has already been approved as the "Total Project for Shinrin Therapy". This approval system represents a major goal in terms of generating economic benefits for prefectures, cities, towns, villages and corporations and for reviving community forests in Japan. From 2005 to 2010, 42 sites have been approved. The present plan envisages approvals for 100 shinrin therapy stations within the next 10 years. It is hoped that creating 50-100 shinrin therapy stations throughout Japan will contribute to better forest management and help revive forests all over Japan. Since urban residents living in stressful environments find such therapies an effective means of relaxation, from a preventive medicine perspective a reduction in national health care expenditure can also be expected. Furthermore, as pioneers in this kind of therapy, we will be accumulating a vast amount of physiological data and scientific information.